Artificial intelligence, or AI, has slowly begun to influence higher education around the world. Now, one new AI tool could change the way university students evaluate their professors. The tool is called Hubert. 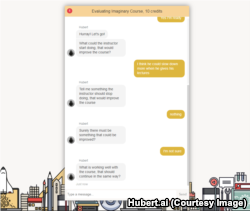 It is a teacher evaluation tool that appears as an AI-powered chatbot. Instead of filling out a form, students use a chat window to give feedback on the course and their professor. Afterwards, Hubert categorizes the students’ comments for the professor to review. The beta version of Hubert launched about seven months ago. It is free for educators to use. More than 600 teachers use it already. The goal of the new Hubert program is to improve education by giving teachers detailed, organized feedback from students. Viktor Nordmark, from Sweden, started the company in 2015, with several friends. Before creating Hubert, the founders asked teachers what would improve their teaching skills. The answer, Nordmark said, was qualitative feedback from their students. In other words, teachers wanted students to write detailed answers to open-ended questions about their experiences in class. So Nordmark and his friends designed Hubert as a compromise between a traditional survey and a personal interview. “You can reach a really large crowd, but you can also get really qualitative data back,” Nordmark said. First, they ran a program to train Hubert to understand human conversation. Hubert learned different types of comments, and how to respond to them. Then Hubert learned how to organize the comments it received into categories. 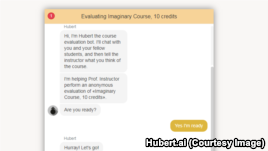 Now, when Hubert receives comments from students, it compares them with the information already in its system to organize the data. This idea, Nordmark says, is that Hubert will continue to get smarter as it receives more comments. What makes Hubert special is its similarity to communicating with a human. For some professors, this feature helps them receive higher-quality feedback. “It allows students to zero in on things that are of interest to them… of concern to them, and a chance to say something good… they can essentially present what their concerns are…and it’s not threatening,” said John Munro, an associate professor of business at the University of the Virgin Islands. Munro believed traditional methods of evaluating professors were not very helpful. They happened only at the end of the course, and the questions were formed around a four-part ranking system based on traditional lecture classes. These kinds of surveys, Munro said, did not give him the right information to make effective changes in his classroom. In contrast, professors can offer the Hubert evaluation anytime they want. The chatbot asks students four questions: What could the instructor do to improve the course? Is there anything the instructor should stop doing? What's working well? How has the class been over all? Munro thinks the “chat” format of the evaluation helps get more information out of students. “Everyone, both students and professors, are already comfortable with chats,” Munro said. Hubert evaluations might also be helpful for English language learners. Samuel Adams is an instructional technology specialist in English language programs at Temple University in Philadelphia, Pennsylvania. He tested Hubert with his English teacher training course. “On average, we get very little written feedback from language learners,” Adams said. Adams found that Hubert was effective in getting written feedback about his course. But it did have its limitations. Adams found that the pre-set interview questions made it impossible to get information about other parts of his teaching. And the feedback is also organized into pre-established categories. Nordmark says he and his co-founders have plans to make Hubert more flexible and accurate. They would like to give teachers the possibility of selecting their own evaluation questions. And they will teach Hubert to create its own categories, so that it can more correctly organize information. This feature would also allow Hubert to be used outside of education systems. Its creators also want to make Hubert more human-like and possess qualities such as humor in the interviews. Another goal is to let Hubert users share the information they are learning. If teachers are discovering strategies that work well in their classrooms, Nordmark wants to develop a way for them to share that advice with other Hubert users. Phil Dierking reported this story for VOA Learning English. Kelly Jean Kelly was the editor. What are other ways you think artificial intelligence could be used in higher education? We want to hear from you. Write to us in the Comments Section or on our Facebook page. feature - n. an interesting or important part, quality, ability, etc. flexible - adj. an interesting or important part, quality, ability, etc.